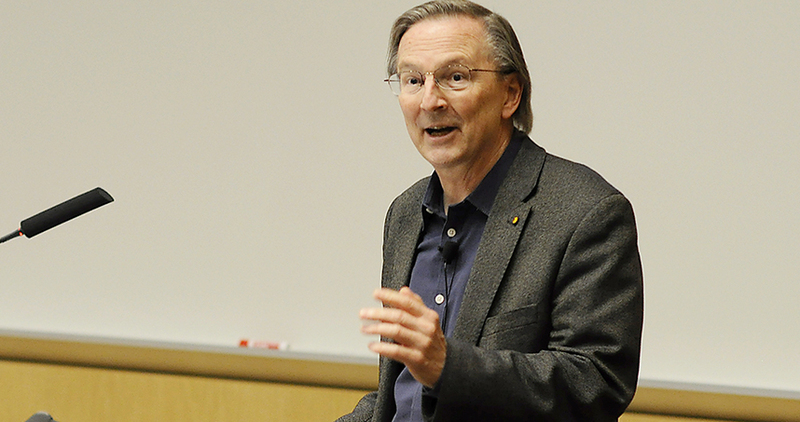 Nobel laureate Jack Szostak addresses a standing-room-only crowd in Pancoe Abbott Auditorium in Evanston. Szostak mingles with students after delivering his lecture, "Systems Level Puzzles in Protocell Design." With nearly 40 billion potentially habitable Earth-like exoplanets spinning around the solar system, it seems highly probable that astronomers would find life on at least one. Yet they have not. As a part of the Simpson Querrey Institute’s (SQI) Distinguished Lecture Series, Szostak discussed “The Transition from Complex Chemistry to Simple Biology” in a pair of lectures at Northwestern University on March 29 and 30. Szostak is a professor of genetics at Harvard Medical School, professor of chemistry and chemical biology at Harvard University, the Alex Rich Distinguished Investigator at Massachusetts General Hospital, and an investigator at the Howard Hughes Medical Institute. In Szostak’s first lecture, “The Surprising Chemistry of Nonenzymatic RNA Replication,” he discussed his laboratory’s recent progress toward developing a system for the chemical replication of RNA. His second lecture, “Systems Level Puzzles in Protocell Design,” summarized his attempts to study Darwinian evolution by developing primitive cells. In order to investigate the origins of life on Earth, Szostak developed a primitive cell, or “protocell,” made of a self-replicating genetic polymer and a self-replicating membrane boundary. After feeding the protocell, he noticed that it grew from a sphere into a very long, fragile filament, which broke apart into smaller, “daughter” spheres. These smaller spheres then either grew or shrunk as they competed for food. “We found there are multiple ways of driving growth and division,” Szostak said. Next, Szostak’s team sought to see if RNA could replicate inside his protocell system. He faced, however, a major challenge. Magnesium, which is required in high concentrations for RNA to copy, destroyed the cells’ membranes. After looking for potential acids to bond with magnesium to protect the membranes, his team found that citric acid, or citrate, worked well. When added to the cells, citrate protected the membranes while still allowing RNA chemistry to occur. Szostak’s group continues to extend his protocell model to learn about its metabolism, understand how it maintains balance, and predict the types of physical environments that could support this primitive cellular life. Understanding these adaptations could provide clues to how modern cells evolved.